Not all epoxy flooring are made equal. Some are made from the cheapest options for practicality. Some take advantage of its unique features, durability and easy maintenance, like the ones for commercial use. Some are more personally tailored. These are the ones constantly scrutinized by public eyes. That’s why acrylic flakes are here. For garage floors needing constant good looks, colors matching, and imperfections hidden, these color chips are here to the rescue. They add beautiful color explosions for a custom-designed look. For DIY people, here are the basic steps in coating your garage floor with epoxy enclaved in beautiful acrylic flakes. Grind or sand down any uneven areas. Pressure wash concrete, spot degrease any areas with oil and grease accumulation. You can see water pulling up on top of grease. Pour degreaser and scrub the surface. Once done, fill cracks and large seams with epoxy crack repair filler. You can fill large gaps with cement based any patch products out there. Now you can mix epoxy part A with part B. You can use a squeegee or a roller to spread epoxy. Remember, spikes shoes allow walking on the wet epoxy. You can apply 2 coats of epoxy if it looks too thin. Apply acrylic flakes or polymerized sand, apply while base coat is wet. The easiest way to apply them is to pour them into a bucket, grab a handful at a time and just toss them into the air like you are feeding chickens. Double broadcast ratio means the flakes will leave no base coat visible. Full broadcast requires more chips thus you can do bigger handfuls when applying. Not all of the flakes are going to stick to the base coat. When dry, vacuum any loose flakes. Sharp edges require sanding. Apply a second coat and broadcast with acrylic flakes in the same fashion as the first coat. Mix and apply a UV resistant top coat. Since broadcast was applied, use 2 coats of topcoat to give it a good shiny finish. Add non-slip additive such as shark grip. A very nice color effect is glow in the dark sand. Now that you know how to use color flakes to add beautiful effects or hide imperfections, have fun choosing the colors that match your taste and provide your desired effects. 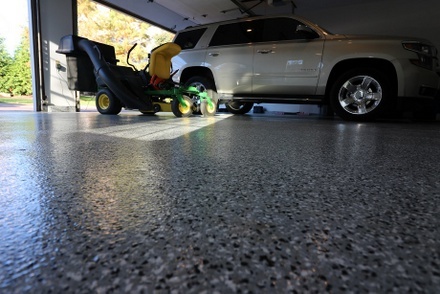 Whether you are planning to DIY your own metallic epoxy flooring garage or hire a professional to do it, knowing you can choose the colors and the density gives you the confidence of the transformation you can do to your epoxy garage flooring.